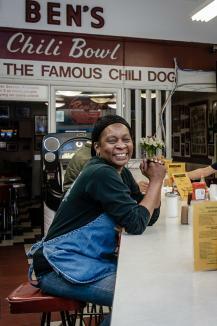 Friendship, family and fun have been at the heart of what has made Ben’s Chili Bowl a neighborhood landmark. Opened in August 1958 by Ben and Virginia Ali, Ben’s Chili Bowl remained committed to serving its clientele in a neighborhood that deteriorated after the 1968 riots, came to a virtual standstill during construction of the U Street Metro yet is now is enjoying a resurgence with new businesses starting to see the great opportunities to be found here. Maintaining your business in an area that has experienced that kind of change and challenge takes a commitment beyond making great chili every day. It takes a belief that the presence of your business can help people’s lives. The Ali’s have always believed that supporting the community with a place where people feel at home, that provides jobs and a sense of family are keys to reclaiming their neighborhoods. City First Bank recently provided financing to Ali Boyz, LLC, which owns Ben’s Chili Bowl, to expand its operations. The new locations include a new site in Rosslyn, Ben’s Next Door and a future operation on H Street, NE. The newest restaurant will contribute to the on-going revitalization of the H Street Corridor. The first floor of the building will house the H Street Ben’s Chili Bowl and carryout, and the second floor and roof deck will house a restaurant concept that will mirror Ben’s Next Door and complement Ben’s Chili Bowl on U Street.